The feedback model of self-regulation developed by the authors of the lead article in this volume has been one of the most successful theoretical formulations of regulatory processes to date. The range of phenomena to which this framework potentially applies is evident from its ability to incorporate implications of other conceptualizations as diverse as catastrophe theory and dynamic systems theory. The diversity of issues and approaches dealt with by Carver and Scheier is matched by the companion articles, which are written from perspectives ranging across developmental psychology, cognitive science, clinical psychology, and organizational decision making, as well as mainstream social cognition. "…includes a provocative lead article by Charles S. Carver and Michael F. Scheier, 10 insightful chapter-length commentaries by highly respected theorists, and a summary and rebuttal by the lead article's authors….As one might expect from such an ambitious lead article, the commentaries by other theorists are similarly creative, thoughtful, and well worth reading….In summary, Carver and Scheier have produced an ambitious contribution that advances exciting new ideas, engenders lively controversy, and suggests directions for future research." Contents: Preface. C.S. Carver, M.F. 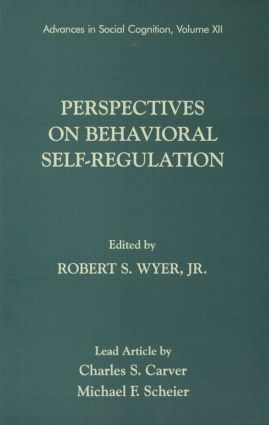 Scheier, Themes and Issues in the Self-Regulation of Behavior. M. Csikszentmihalyi, J. Nakamura, Emerging Goals and the Self-Regulation of Behavior. J.P. Forgas, P.T. Vargas, Affect, Goals, and the Self-Regulation of Behavior. P.M. Gollwitzer, U.B. Rohloff, The Speed of Goal Pursuit. H. Grant, C.S. Dweck, Content Versus Structure in Motivation and Self-Regulation. E.M. Pomerantz, E.R. Altermatt, Considering the Role of Development in Self-Regulation. R.M. Ryan, E.L. Deci, Approaching and Avoiding Self-Determination: Comparing Cybernetic and Organismic Paradigms of Motivation. J.A. Sniezek, Issues in Self-Control Theory and Research. Confidence, Doubt, Expectancy Bias, and Opposing Forces. A. Tesser, Responding to Attempts at Control: Autonomy, Instrumentality, and Action Identification. R.R. Vallacher, A. Nowak, The Dynamics of Self-Regulation. C.S. Carver, M.F. Scheier, A Few More Themes, a Lot More Issues: Commentary on the Commentaries.